The weekend started hot and got hotter—perfect weather after a long cold spring. 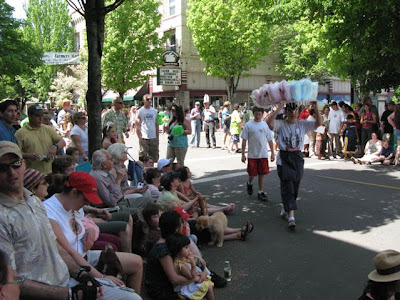 As promised we took off Saturday and drove to McMinnville for the annual UFO festival and parade. 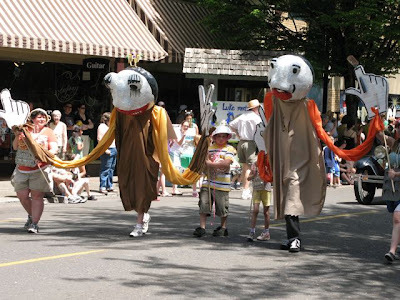 As festivals go it was a little on the slow side, but the parade was energetic and typical of small-town parades everywhere: an alien queen, several politicians, performing children, and lots of old cars. 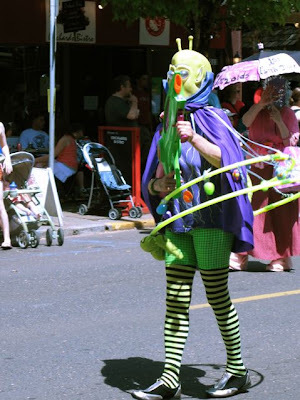 Since this was a UFO festival there were some pretty outrageous costumes, as well as the expected contingents from Star Wars and Star Trek. The aliens all looked like aliens (antennae, green skin, pointed ears—why is this?) and they were holding up well despite the heat. One of my favorites was a family carrying an Earth travel guide, peering closely at bystanders and pointing out imaginary sites. Made me feel right at home. On Sunday we planted our garden. This was a big step for us, having never had a vegetable garden. This year we rented a half-box in the development's community garden, thinking we should start small. We planted lots of tomatoes, cucumbers, carrots, radishes, a squash, peppers, onions, marigolds and zinnias. The marigolds are to keep bugs away; the zinnias because I like them. 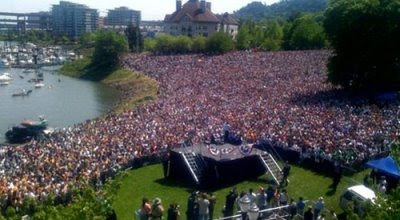 Sunday was also the day that Barack Obama held a rally in Portland's waterfront park and 75,000 people showed up. Among them were Jennifer and Melina who, because she was a toddler, got to sit under a tree near the speaker's stand. We considered going but changed our minds after we thought of standing in line and then sitting in the hot sun for four hours in 90+ degrees. Apparently the line stretched for 20+ blocks through downtown Portland. What an amazing event. As I write Kentucky and Oregon are voting, Ted Kennedy has been diagnosed with a cancerous brain tumor, and the Israeli press is reporting that Bush plans to bomb Iran sometime this summer. I think the aliens are smart to stay away.